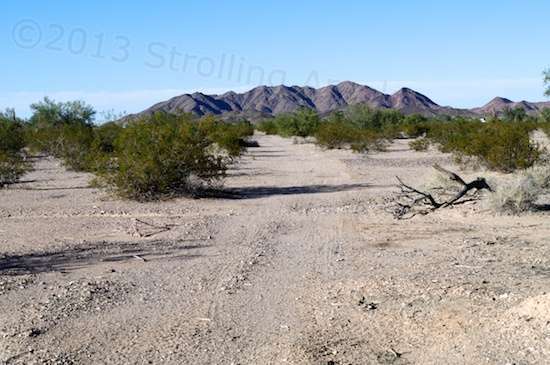 The hills all around Quartzsite appear to be made up of rubble! Piles of rocks, sand and gravel. The other day I decided to visit the odd, isolated little development I’d seen off in the distance. From far away, the buildings made it look like an industrial area rather than a housing development. I wanted to find out badly enough to spend the one or two gallons of diesel fuel that it would take. 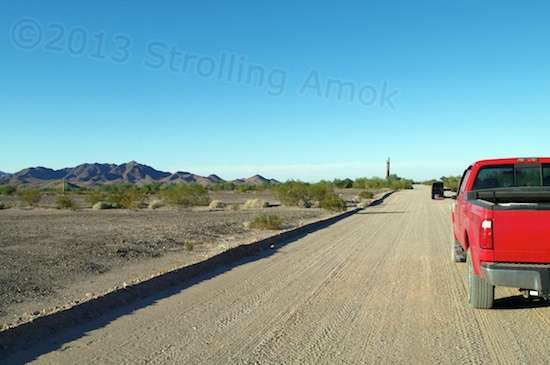 So I looped around to the north on paved roads from Quartzsite itself, went west, and then south to get there. Turns out it was a small remnant of a failed housing development called Rainbow Acres. What was there was nicely done, but was only a small fraction of what had been laid out for it. I cruised the streets to find that each lot was ringed with low brick walls. Many were for sale, but at about $70K for a bare lot, these folks apparently were unaware of the housing collapse. This is fairly low land, and washes interrupt the lots here and there to allow storm water to go on through. Most of the lots serve as parking spaces for RVs, with sheds and tall canopies. Some lots have stick-built homes. One of the grid roads in the undeveloped section, left unused. Some were overgrown or cut by washes. 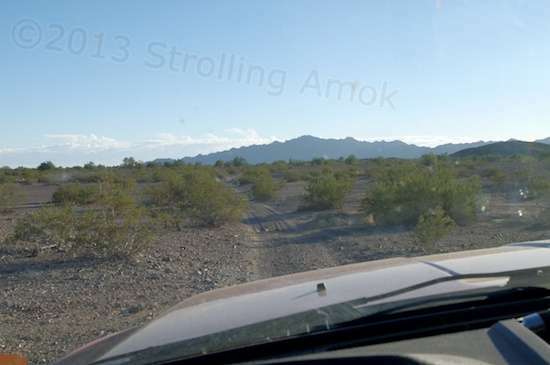 I wound up touring the original perimeter using my GPS, and found that some roads had turned into washes, making it necessary to stay awake to avoid dropping a wheel into a drop-off where water had scoured away the gravel and sand. 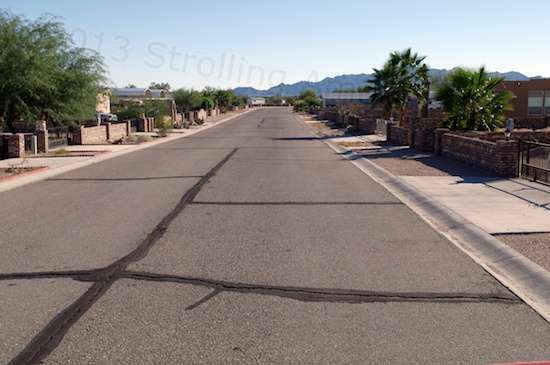 The Google map had shown that there was a connecting trail between this development and Old Yuma Road in the LTVA I am in. The GPS showed nothing, so when I come upon a likely-looking trail at the southeast corner, I took it. It was very easy going except for crossing a wash at the halfway point. Before crossing, I got out and walked it. Not great. As I’ve previously pointed out, I’m reluctant to four-wheel with 9,000 pounds of sole means of transport. However, in this case I estimated that the walk back home would be about 4 miles or so, if push came to shove. The fine gravel on the approach was pretty squirmy underfoot, but was a downhill run. The wash floor itself seemed okay enough, and the thick dust on the far side to get back up seemed do-able. Going in this direction seemed pretty safe. Heading back the other way would have required some real momentum because that gravel would tolerate no wheelspin. I put the Furd into 4Hi and everything was fine going across. A look back at the tracks the Ford had made showed that that squirmy downhill gravel had allowed the tires to sink fairly deeply, but the floor looked great. Slippage in the deep dust at the climb-out was minimal because it was simply packing down under the tires as I let momentum carry the truck up instead of adding a lot of throttle. Whew! I’m not into making a You-Tube moment for myself, and there’s a difference between sport and necessity. Luckily, everything went well – in this direction. The rest of the drive back was a boulevard tour. 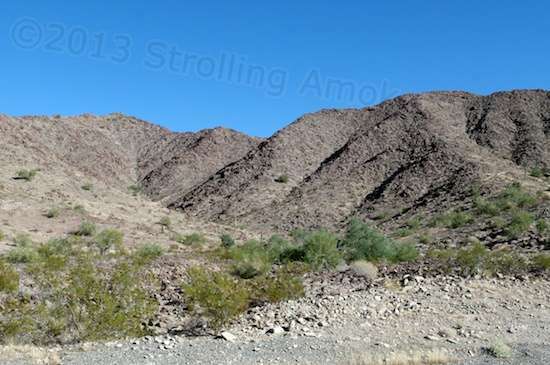 I did take a short run down a stubby branch that it purported to be the real, original Old Yuma Highway, but stopped at another wash with a very rough and steep climb-out. This stub was narrowed by bushes, and was clearly relegated to being an ATV trail now. The bottom of the wash was abrupt enough to be an exhaust pipe dragger for the F-250. So, with the sun getting pretty low in the sky, back home I went! Once past the wash crossing, it was trail nirvana! 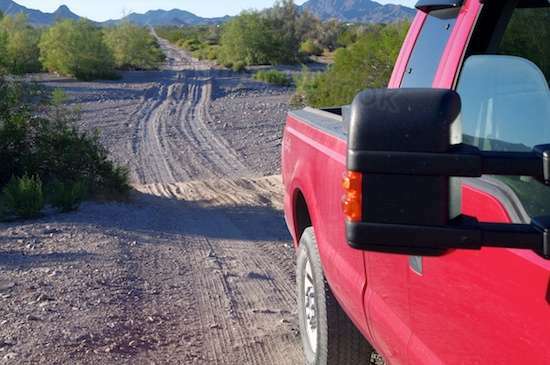 The original Old Yuma Road was a tad narrow, and quickly got challenging. Bushes out here aren’t fluffy – they scrape paint! Everything in the desert is out there to hurt us. Plants and animals. Well, actually only the animals are out to hurt me. The plants are out to hurt the F-250’s paint job. Curiosity is a holy thing! Thanks for sharing yours. Seems like you are able to spend more time this year exploring and sight-seeing a bit. Hope that continues for you. Well, it’s the exception, as far as fuel usage goes. My touring resources may improve a bit in a few years. Until then, the bike is my friend.